Team Strong Heart in the News! 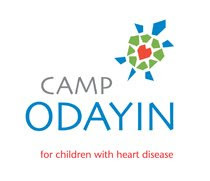 Click the following link to read about how the students at Oxbow Creek Elementary School in Champlin, MN raised money for Camp Odayin. Surgeries: One, with a second surgery scheduled for the end of March. 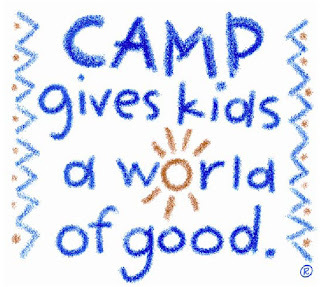 Camp is to make friends who have heart conditions. It was also fun to do all the things we did at camp--crafts, games and walking around. Greg, Neil, Tim and I and our Crew Chief, Bill did our first "RAAM style" 24 hour simulation with support vans this weekend. We had two goals in mind. First, team building. This was the first time that all 5 of us were able to get together and ride. Second, we really wanted to get a feel for what the logistical challenges are for leapfrogging vans and rider exchanges in 3 and 4 rider rotations as well as learning to navigate with GPS and mapping software. We learned lots! First off, we are blessed to have such a great group of people in Team Strong Heart! We work and ride exceptionally well together. Second, we really got a feel for the challenges that come with rotating riders every ~30 minutes. To make things a little more difficult, the riders also had to crew for each other! It's was valuable for the riders to get the opportunity to learn crewing. Although 30 minute rotations might seem odd for a simulation that last 24 hours or a race that lasts 6 to 7 days, it allows the riders to keep the intensity significantly higher without tapping into reserve stores or breaking themselves down. Being competitive in RAAM means keeping the average speed over 3100 miles at 20+ mph! Most competitive RAAM 4 person teams employ a rotation strategy that keeps two of the riders out on the road for 2 to 5 hours (depending on conditions and time of day) while the other two rest in the RV. The two riders on the road each are assigned a support vehicle (mini van) and two crew members. The first rider puts in a 30 minute ride with the support vehicle closely following for safety. The second rider gets in the other support vehicle and drives about 8 to 10 miles up the road and waits for the first rider to overtake. The two riders overlap wheels or tag and the second rider with his support vehicle heads up the road for a 30 minute effort while the first rider is driven up the road 8 to 10 miles. On and on...during the RAAM we anticipate up to 350 rider exchanges in the 3100 mile course! If one rider gets injured or ill, the rotation goes to a 3 person rotation that gets more complicated. Each rider will be on a 3 hour shift with a new rider rotating in every 1.5 hours while maintaining the same 30 minute efforts. This requires more work from the riders and crew. We started off at noon on Saturday on a loop around the Stillwater area. Great scenery, good hills. Greg was taking college tests and couldn't make it out until 4pm so we worked on rotating three riders. At 5 pm, we rode over to Champlin to get experience with night riding on some safer roads and base the "graveyard" shift out of my house. Since the riders were also crewing, no one would get any rest or sleep unless we stopped the driving. Even with that no one got more than 2 hours of sleep. Neil and I got done with our shift at around 6am. I whipped up a big batch of waffles and we all got up wolfed down our first "real meal" and headed back out for more practice...only this time Angie was with us and having 2 crew made life significantly easier! Our next big practice session is scheduled for May 12 & 13. We've planned a 36 hour simulation with 6 crew members, all 4 riders, two support vehicles and an RV to learn how to run things just like they are planned to happen in RAAM. I've heard that the best plans are typically blown away after 24 hours of RAAM, so this experience is extremely valuable in teaching us how to adapt and roll with the punches! 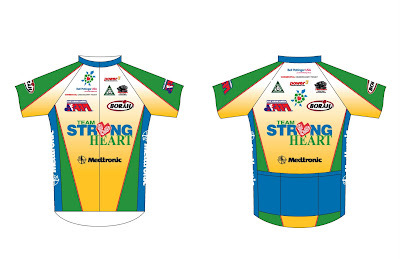 Team Strong Heart Jersey Design! A huge thank you to Karen West-Reger for all her hard volunteer work! The jersey and shorts design look great! Karen must have come up with at least 30 different designs and revisions over the past couple of months, each one worthy of racing in. Very impressive considering this is Karen's first cycling jersey design experience! If you'd like to show your support for the Team and Camp Odayin, this jersey is also available for purchase. All profit from jersey sales will go directly to Camp Odayin. Contact bernie.kaeferlein@medtronic.com to order yours! Click on www.teamstrongheartstuff.blogspot.com for all Team Strong Heart Merchandise on sale now! A very cool way to "Show" your support! Diagnosis: Two time heart transplant recipient. 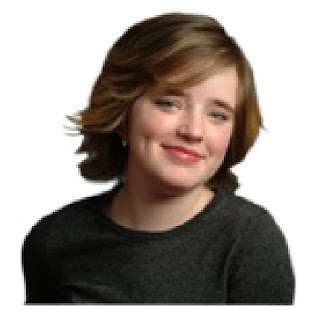 The first transplant was at age 4, because of restrictive cardiomyopathy, probably because of a virus attacking her heart, and was in congestive heart failure. 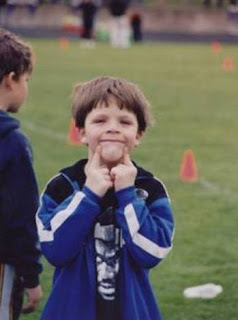 The second was at age 12, and was necessary because of severe coronary artery disease, probably because of a low grade constant rejection. Surgeries: Two total surgeries-low in numbers, massive in intensity! She’s also had close to 40 cardiac caths. I love meeting people my same age that have been through the same thing as me. It’s great to share stories about our experiences with surgeries, and I’ve made some amazing friendships. I love the location of the camp, Minnesota is beautiful and it’s nice to get away from the heat of Kansas for a while in the summer. I hope that I can go back to camp again next summer. I know that I will have a wonderful time!